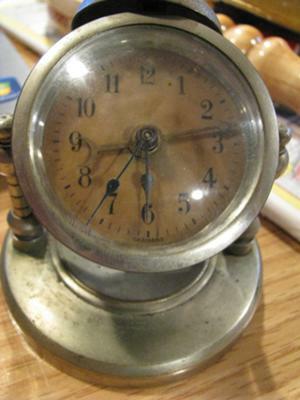 Hello, I was hoping to get an id on this clock. There is no manufacturer listed on it,it just says Germany on the face. It's really cool...I need the info to help out an elderly lady I do home repairs for. Her late husband has a bunch of clocks she wants me to sell on eBay for her, so I kinda need to know what this one is before I list it. Any help would be appreciated, also is it rare? Thanks!! Hi Wes, I am not familiar with this particular clock. Maybe the manufacturer has signed the movement if you took the case apart. 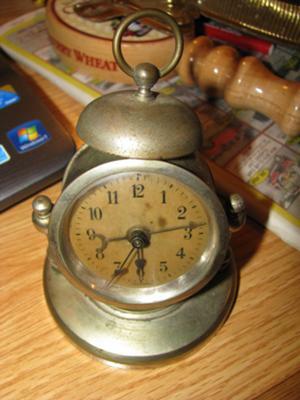 I can not tell by the picture if it is an alarm clock, but it looks like one. I bet it is at least from the 1920's to 1930's. It does not look like a newer style to me. I hope someone will post a comment here if they have any information about this clock. Thank you.